Navneet is an Addiction Therapist with experience of working with co-morbidity, process, behaviour and substance addictions. Navneet has worked as programme director and lead therapist of an addictions’ clinic in India and as a part of multi-disciplinary team working in diverse settings in the UK. 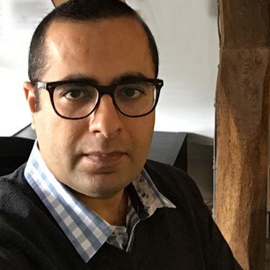 As well as a certificate in addictions’ counselling, Navneet holds a foundation certificate in Integrative Psychotherapy and is currently completing his Masters’ Degree in Integrative Transpersonal Psychotherapy. Working with mental health for over two decades and throughout his personal life experiences, Navneet is empathic and personable; working with cognition and emotion equally effectively, assisting clients in their respective journeys, to a fulfilled and productive life. Navneet holds the Bayberry ethos of respect for confidentiality, diversity – and bespoke recovery and wellness as key aspects in his work. As one of our senior therapists, Navneet provides support to clients across our clinics – and also acts as Programme Manager, ensuring the quality and consistency of delivery of the therapeutic programme.